HYUNDAI I10 BOOT LINERS follow the contour of the boot exactly. Fitted in seconds. 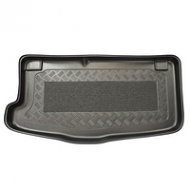 Rubber antislip centers and lipped edges are standard on all boot liners for the hyundai i30.